Full and partial dentures are both removable appliances used to replace missing teeth. A full denture is used when a patient is edentulous (has no teeth). A partial denture is used for a semi-edentulous patient (missing some teeth). Speaking. Missing teeth, especially front teeth, can affect your speech. Replacing missing teeth improves pronunciation. Appearance. Teeth are essential for supporting our lips and cheeks. Once the teeth are lost, the face appears to be collapsed. Replacing teeth with a full or partial denture can help restore that. Self-Esteem. Last, but certainly not least, we want you to feel confident about your smile! Full dentures are a removable prosthetic device. They are custom-made to fit the remaining soft and hard tissues in the mouth. They can be made for both the top and bottom arches. 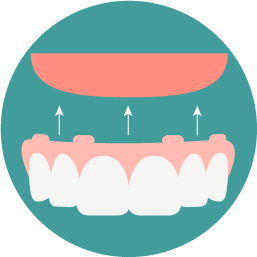 A partial denture is custom-fit around the remaining teeth and tissues. Both options require multiple visits. If you are thinking of replacing missing teeth, please do not hesitate to call our office and set up a consultation appointment.